Not sure which is the right beer gift for the beer lover in your life? Well, you're in the right place. We've put together a list of ideas -- any of which will make the perfect gift for your beer lover. So take a look at the list below, and let us know if you have any questions. We're more than happy to help you select just the right gift. If you're not drinking your beer from a glass that was designed to enhance it's flavor and enjoyment, then you may be missing out on nuances that you never knew your beer had. Come take a look at our assortment of Classic Beer Drinkware, and start enjoying beer the way it was meant to taste. Step into the beer culture of the 1950s and 60s with this entertaining DVD of vintage beer commercials. Contains classic beer commercials like the Hamm's Bear, Bert & Harry Piel, Mr. Magoo for Stag Beer, Mabel--Black Label, and dozens more. It's a truly unique piece of beer history, and loads of fun. Perfect for parties and beer tastings. Not sure what item the beer lover in your life will like best? No problem. Just send him an e-Gift Certificate and let him pick his own poison. Gift Certificates may be redeemed for on-line purchases at any time, and any unused balance will remain available for future visits by the recipient. Come see what our Beer History sample gift certificate looks like! Nothing says "thoughtful" like a rare antique book about your beer lover's favorite subject: beer! We have a limited selection of very scarce and beautiful brewing books from the 1800s and early 1900s. Take it from us: he'll be enthralled with any one of them. Brewer Tom Hennessy teaches you how to build a commercial brewery on a tight budget. He shows you the affordable alternatives to expensive turn-key brewing systems, and demonstrates how to get your commercial brewery up and running with minimal investment. Learn how to find and customize used stainless steel kettles, mash tuns, fermentors, and more. Come take a look at our selection of retro beer t-shirts, highlighting some of America's great old beers. We've got historic brands from Milwaukee (of course), Philadelphia, Denver, Chicago, Indianapolis, and more. We've also got great stuff from iconic brands like Yuengling and Guinness. Be proud. Wear your beer. Buy your beer lover a magazine subscription and you can send him an instant e-card telling him of your gift. 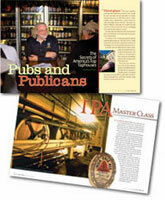 We've got all the top beer magazines: All About Beer, Draft Magazine, Brew Your Own, Zymurgy, Brewing News, and more. It's the gift that'll keep giving all year long. Ever wonder where brewpubs get all those cool old beer photographs and vintage beer posters hanging on their walls? They get 'em from BeerBooks.com! And you can, too. Come take a look at our collection of more 100 different antique beer photos and vintage beer advertising posters. All of our prints and posters are high-quality, professional-grade display pieces, made-to-order by our photo lab and shipped directly to you. Prints range in size from 11x14 up to 40x50. Prices start at just $14.95.